Think On This: Why Are Black Women Excluded From Meetings With Obama? I recently wrote about the scheduled meeting today between President Barack Obama and the presidents of the NAACP and Urban League. Marc Morial and Ben Jealous got together with the president in a situation that is eerily similar to the meeting the three had with Rev. Al Sharpton not so long ago. Any meeting which serves to breathe life into the dire unemployment crisis in the Black community is met with open arms. After the first meeting, I mentioned to Rev. Sharpton that a woman should have been present in these discussions. Sharpton made the accurate point that the late Dorothy Height had been invited, but couldn't make it because of the weather. I'm sure I'm not the only one who noticed that it might be challenging for a 98-year old woman to come out in one of the worst blizzards in Washington D.C. history. A backup to Dr. Height would have been appropriate, or even having women outnumber men would not be out of the question. 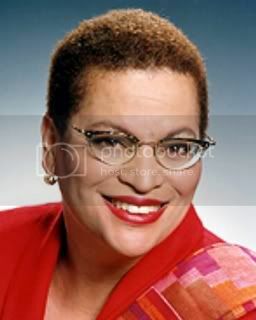 Dr. Julianne Malveaux would have been a perfect choice, since you don't exactly see scores of black women with PhDs in Economics from MIT. Given that the men had gathered to discuss job creation and economic growth within the Black community, I can only imagine that Dr. Malveaux might have something productive to say. The fact that Dr. Malveaux, along with every other talented Black woman in America, is consistently left to the side in these important conversations should be disturbing to all of us. As we fight for the civil rights of our community, we might want to take a second to realize that we are not immune from the temptation of oppression. With all due respect to the men who've taken the time to meet with the president, I grow increasingly disturbed that the powerful Black female political voice has been largely kept in the background. Given that Black men are the most marginalized group of people in American society, it is clear that Black women led the way in building the passionate energy that gave our nation its first Black president. When fighting for what is rightfully yours, there comes a time when you no longer need to be diplomatic. Let's move Black women away from the back of the political bus. I don't comment from the perspective of being a staunch supporter of the President. My comments are intended for people think a little bit differently about a particular subject and many times as of late it has something to do with our current president. I agree that more black female should be consulted when dealing with issues in the field of their expertise. They should not be overlooked. And I can't say unequivocally that they have been overlooked by this president. I think it is fair to say that President Obama has one of the most diverse administrations in history. Regarding his supreme court appointees. He has appointed two women, one Latina and one white. If he had considered more black female judges, but did not select one, folks would still be upset and complain. I just want people to back off some. I think our President is pretty astute and quite mindful of diversity and I'm sure he has not snubbed black female professionals. We do have a black female surgeon general and a black female ambassador to the UN...do we not? One of the things he is loved for is the fact that he is married to a black professional woman and is raising two black daughters. I would say he values the black female voice. Some may argue that we shouldn't cut the President any slack. I actually don't think it's cutting him any slack as much as it is objectively evaluating his role as President and our expectations of him. God bless him. I have never seen so many people put so much weight on one man's shoulders.